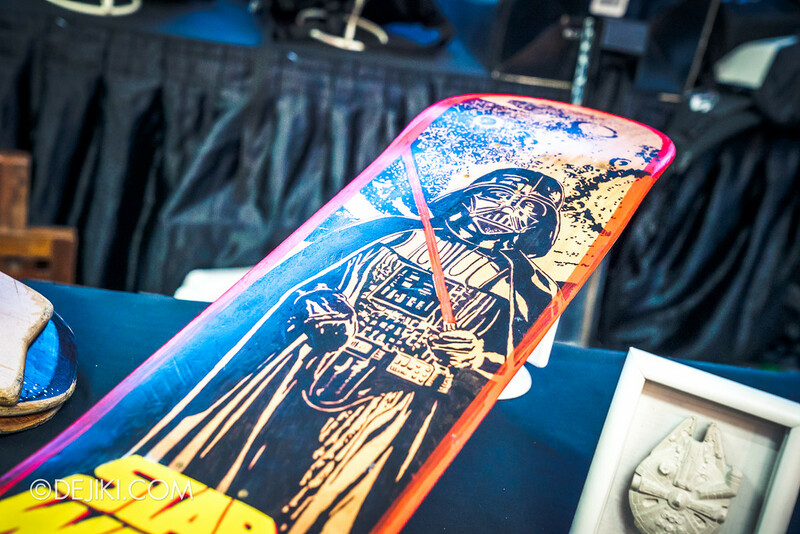 Star Wars Day marks the anniversary of the release of ‘Star Wars: A New Hope’ – the first film in the series. 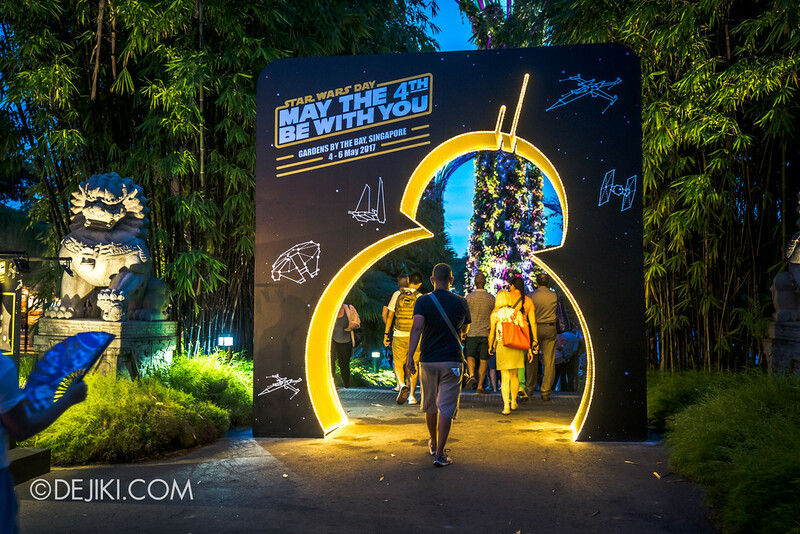 The global (or intergalactic) celebration is also known as, May The 4th, as a nod to the famous line, “May the Force be with you”. 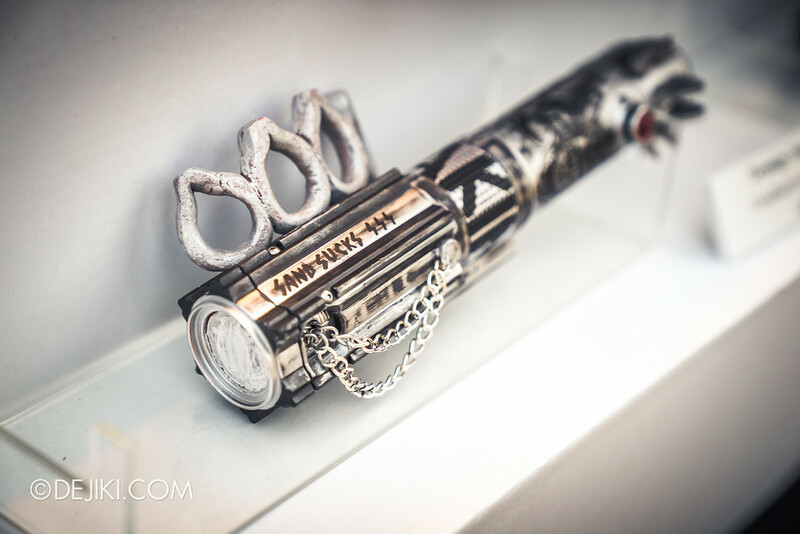 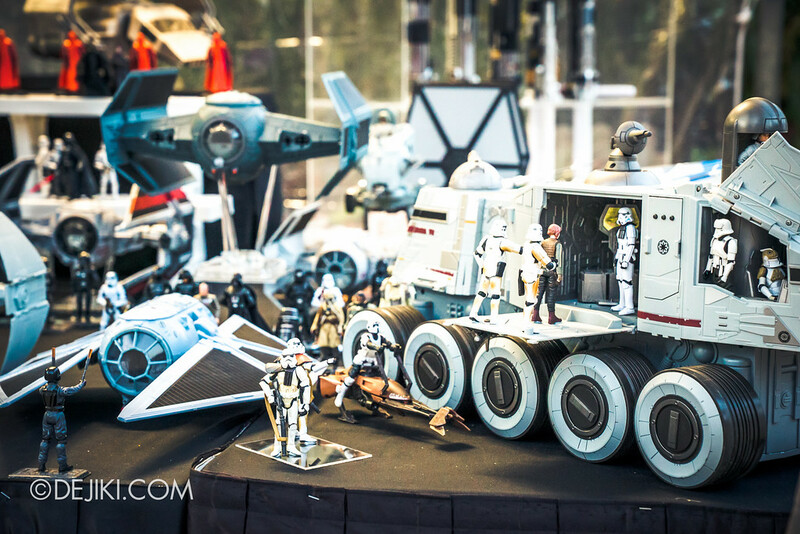 This year is extra special because it marks the 40th Anniversary of ‘A New Hope’. 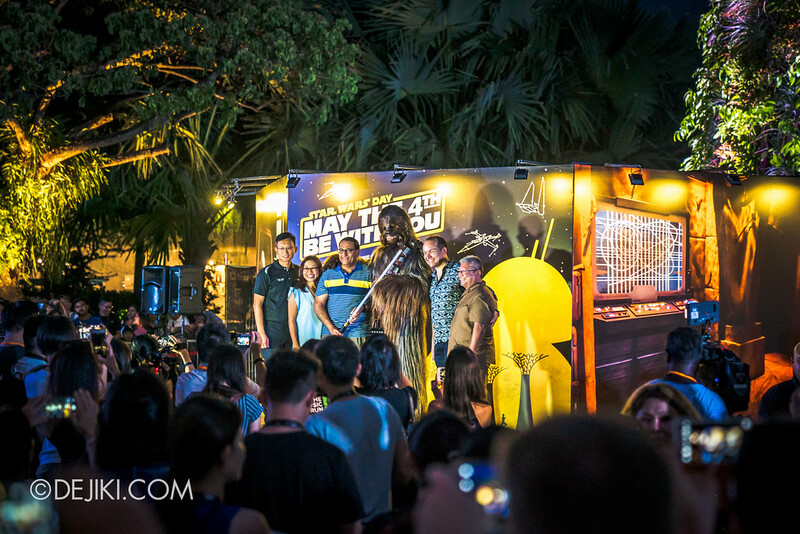 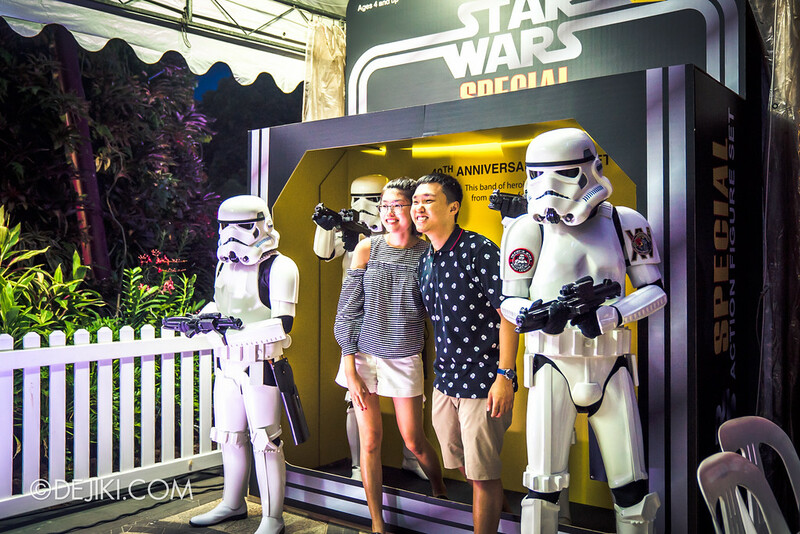 The beloved space-drama saga has taken over the Supertree Grove area of the Gardens, with numerous booths, photo backdrops and activities scattered all over. 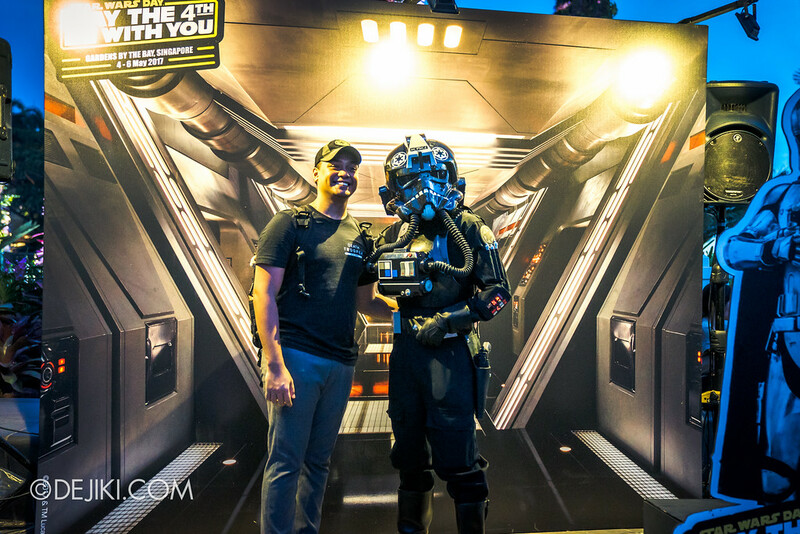 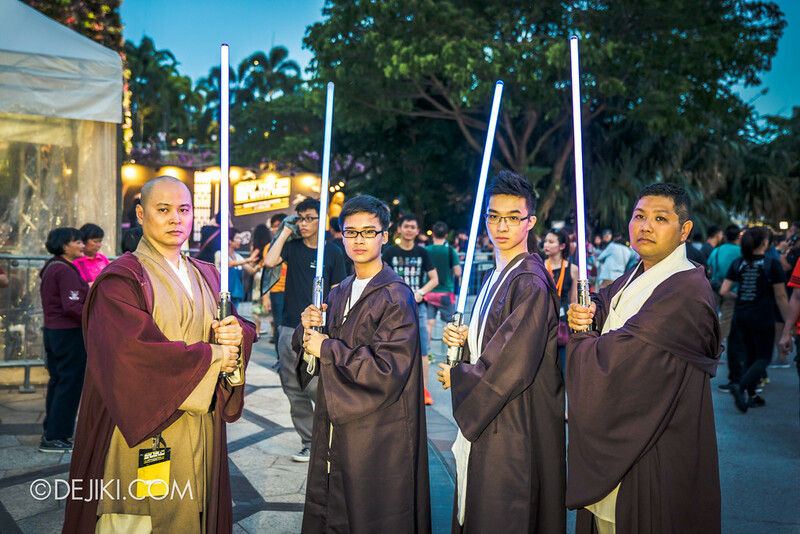 The inaugural Star Wars Run Singapore will also take place around the Marina Bay area this weekend. 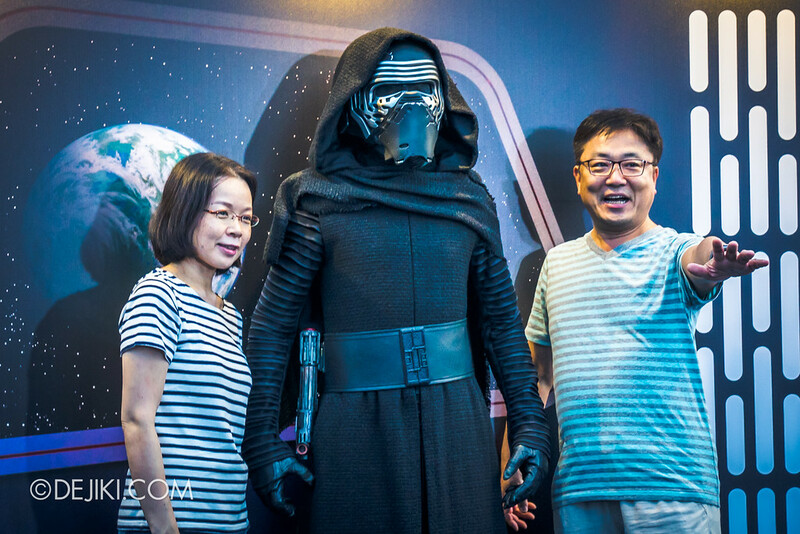 If you love snapping photos of Star Wars characters, you’ll be excited to line up for the Official meet and greet sessions with Chewbacca and Kylo Ren. 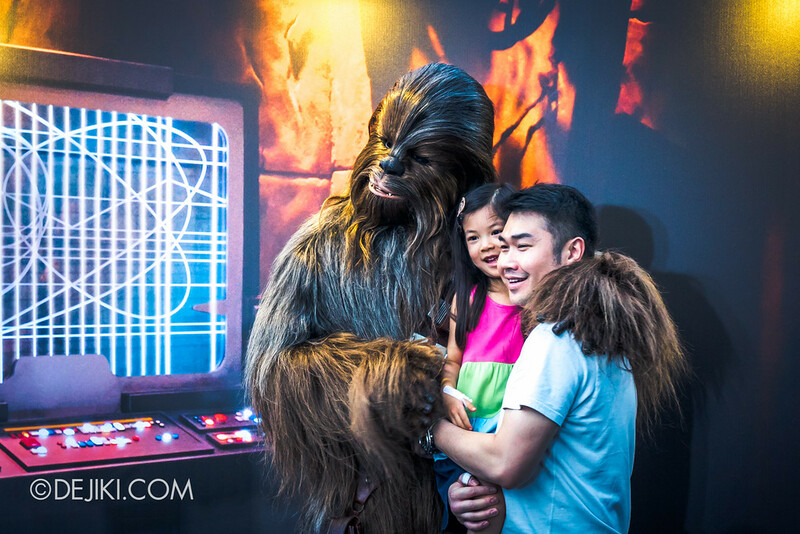 Both characters will appear at the same session, with Chewbacca’s queue stretching so long that it had to be closed early. 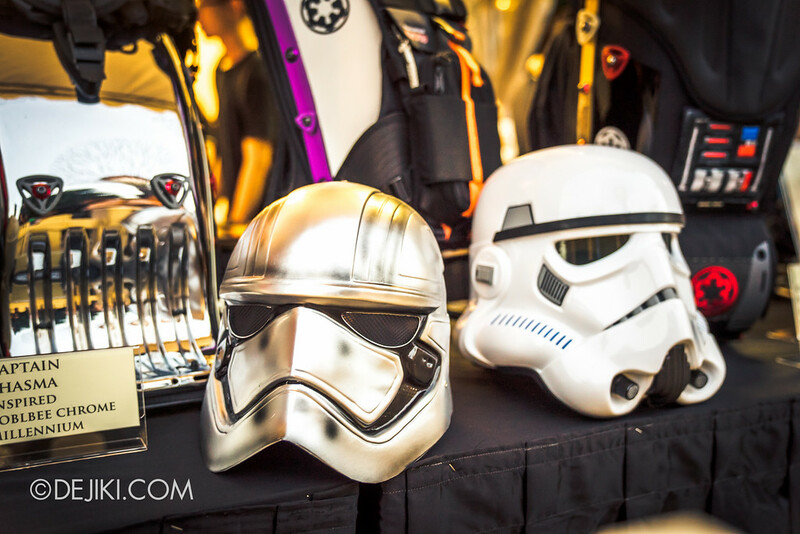 Choose your side wisely! 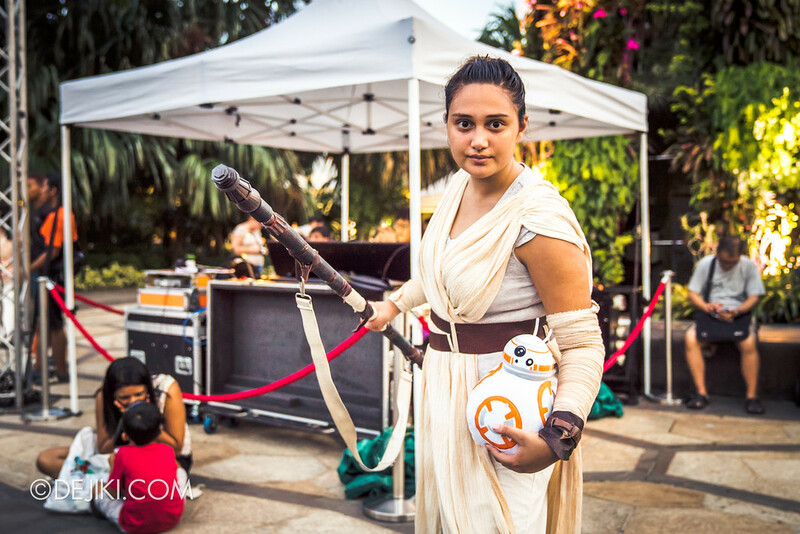 If not, you can encounter many roaming cosplayers at the festival. 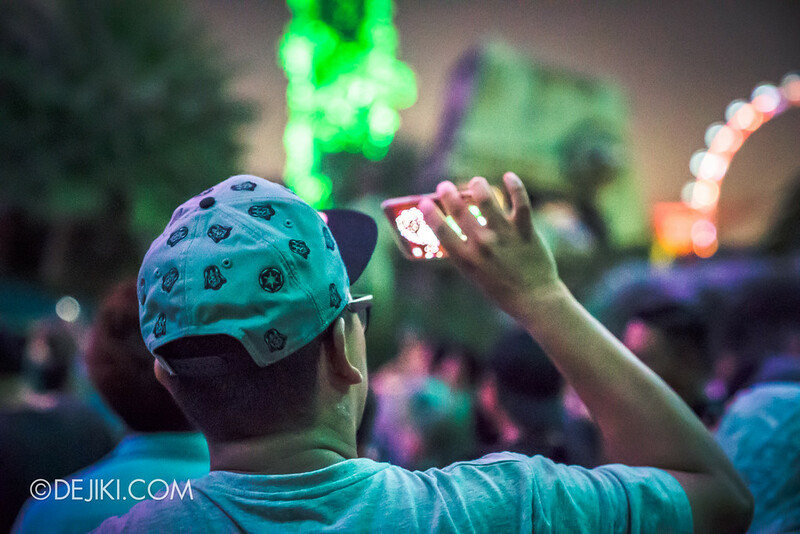 They’re all friendly-enough for selfies or even pose for action shots! 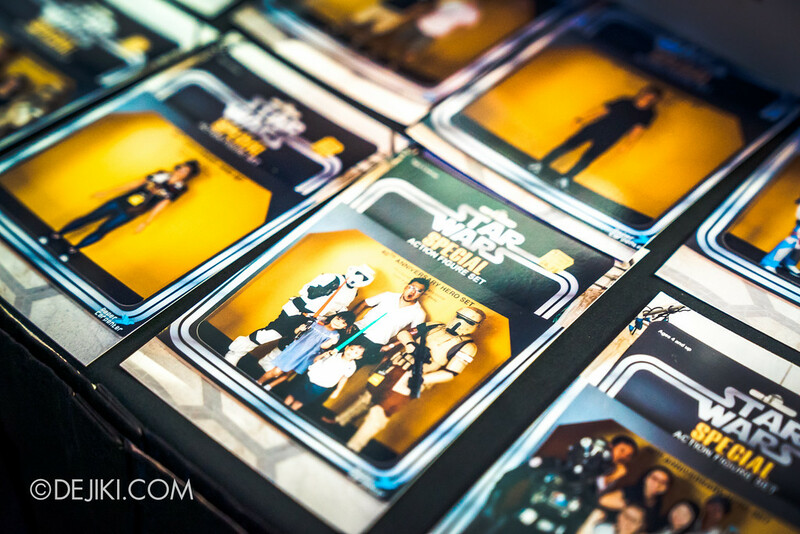 There’s also a charity photo booth at a corner, where you can become a piece of (unofficial) Star Wars memorabilia with a small donation. 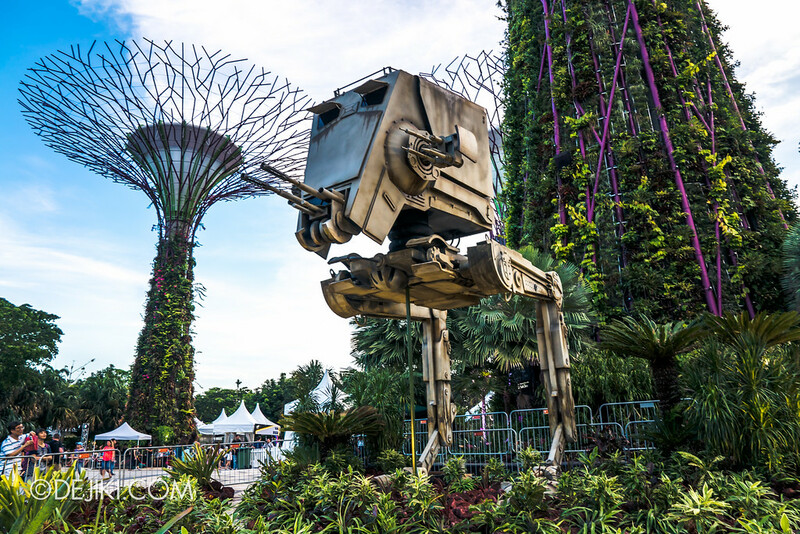 Right in the middle of it all – a scale model of the All-Terrain Scout Transport (AT-ST) guarding the tallest Supertree tower at the Gardens. 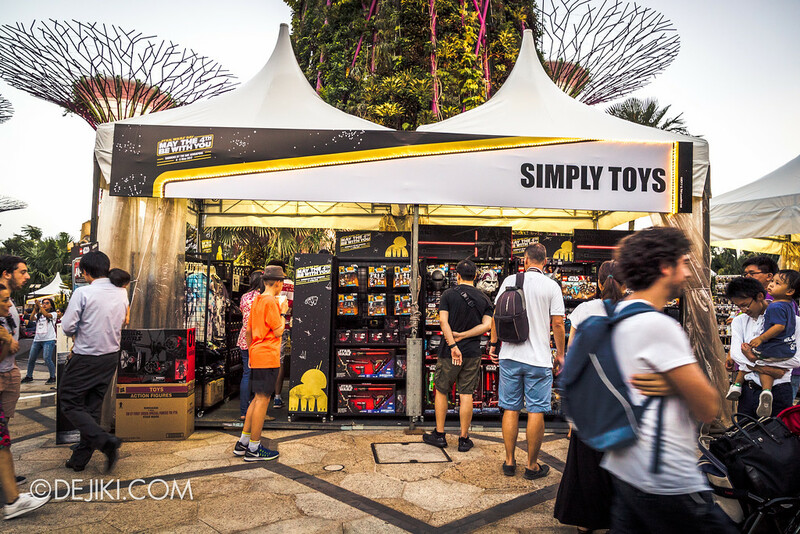 For the shoppers and collectors: Simply Toys, Simply Toys/ Simply Zakka and Royal Selangor are here to vend the official merch. 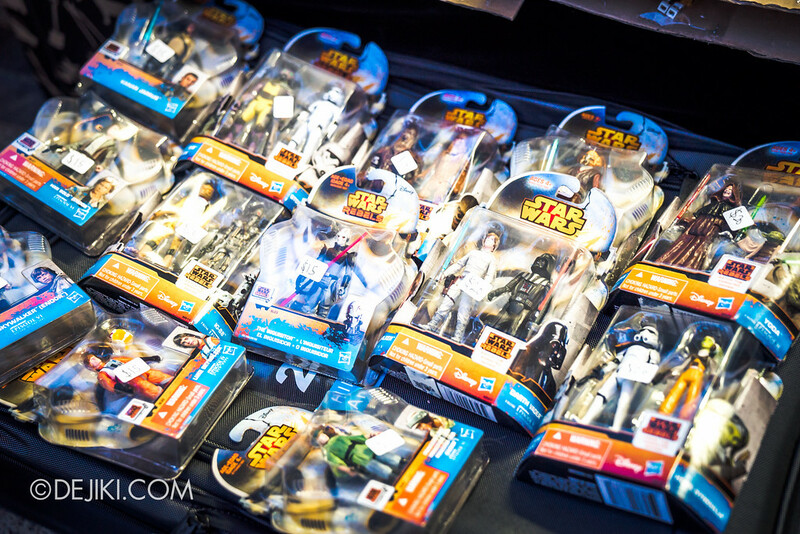 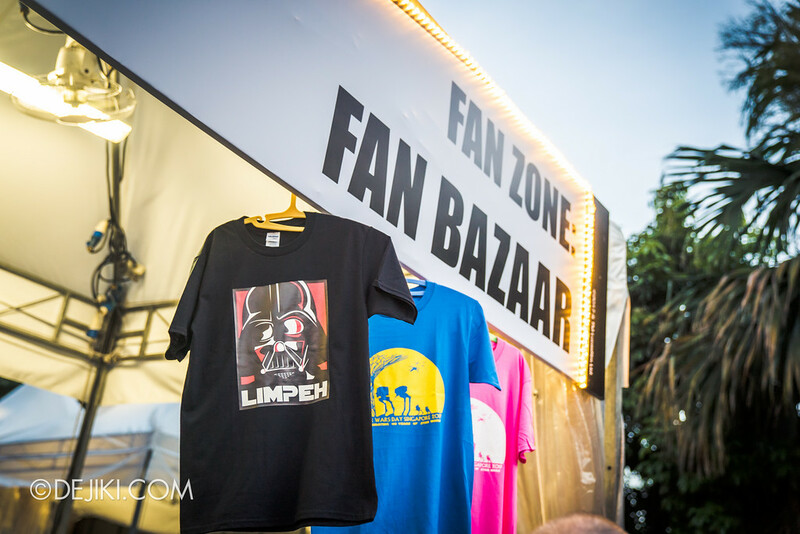 And there are numerous tents with exhibitions of collectibles and fan creations. 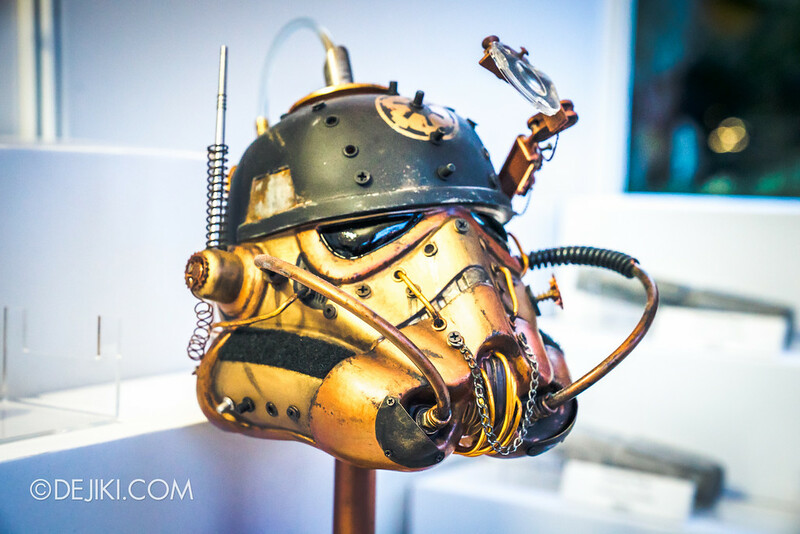 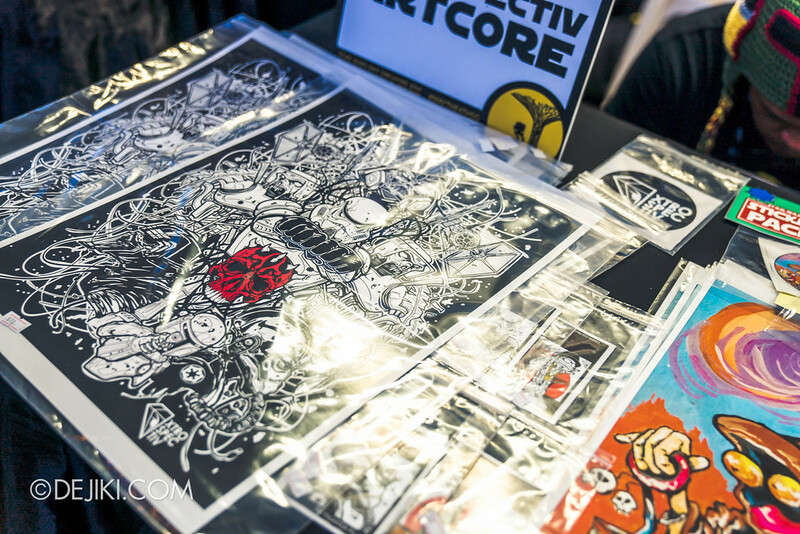 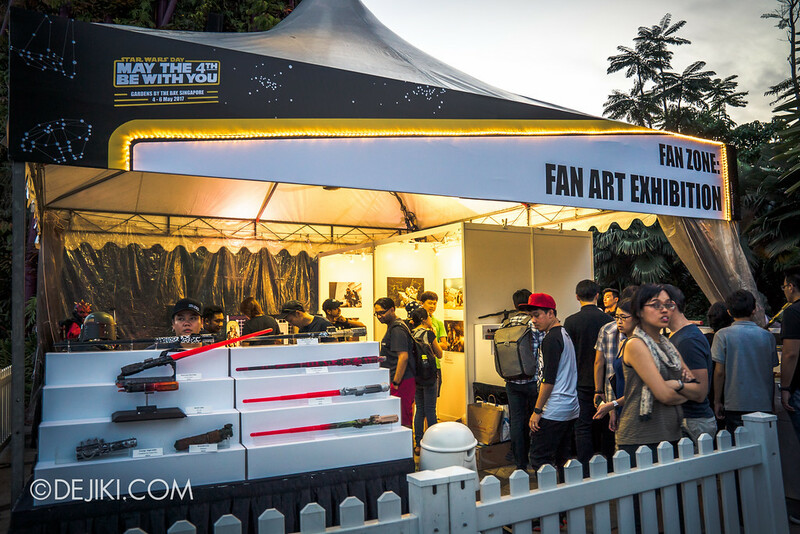 The Fan Art Exhibition and Bazaar are must-see attractions at the festival, because – where else could you see so many wicked creations? 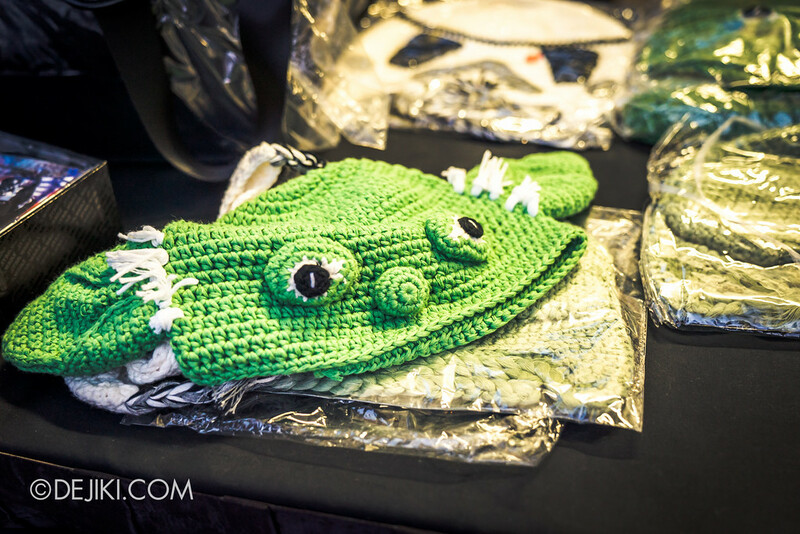 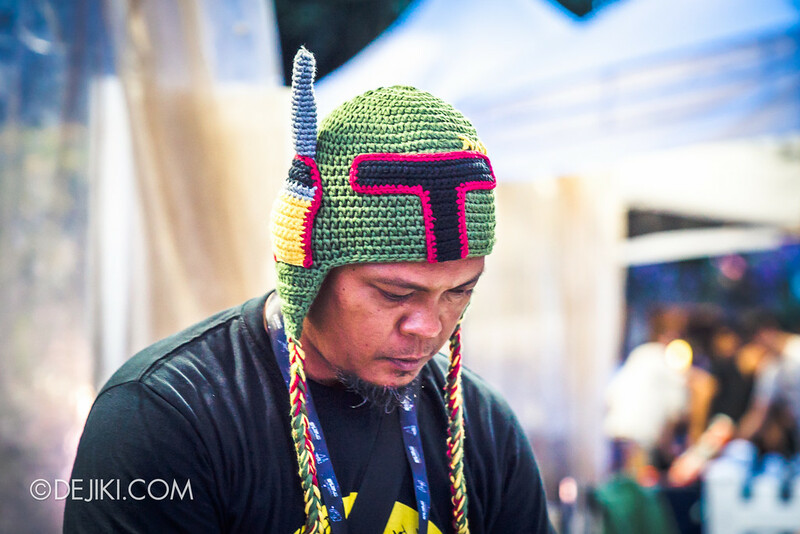 Hop over to the Fan Bazaar, where you can grab some statement T-shirts with a local twist, or cute knitted beanie caps. 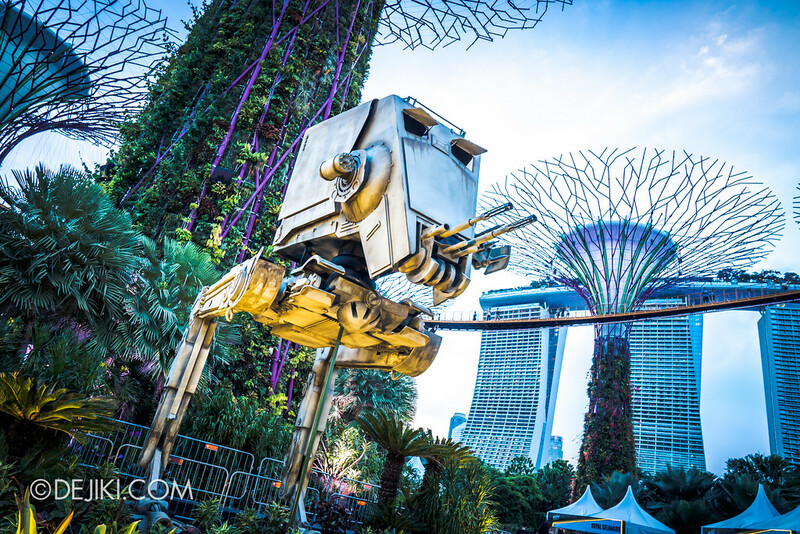 And drumroll for the star attraction: Gardens by The Bay’s signature Garden Rhapsody show, Star Wars Edition. 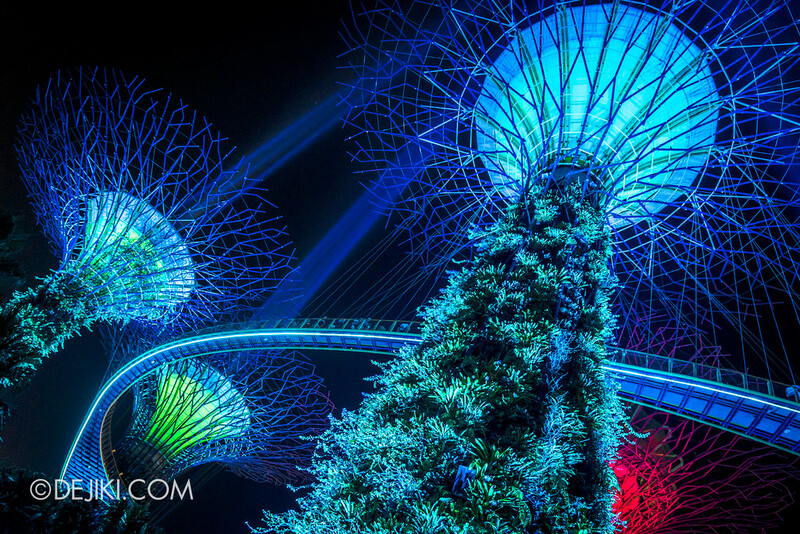 The mesmerising show of lights on the Supertrees and its bridge, which lasts about 10 minutes, is accompanied with an evocative arrangement of Star Wars themes. 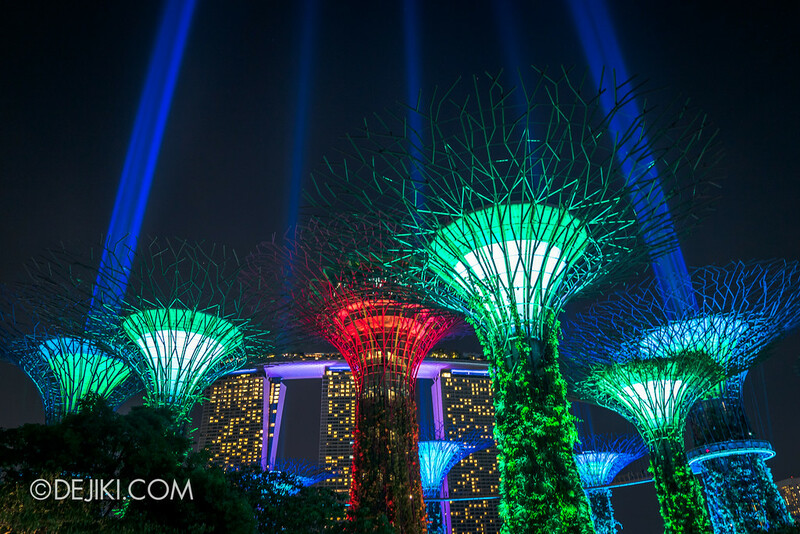 There are three shows available during the festival nights, and thereafter two shows will be performed every night until 2 June 2017. 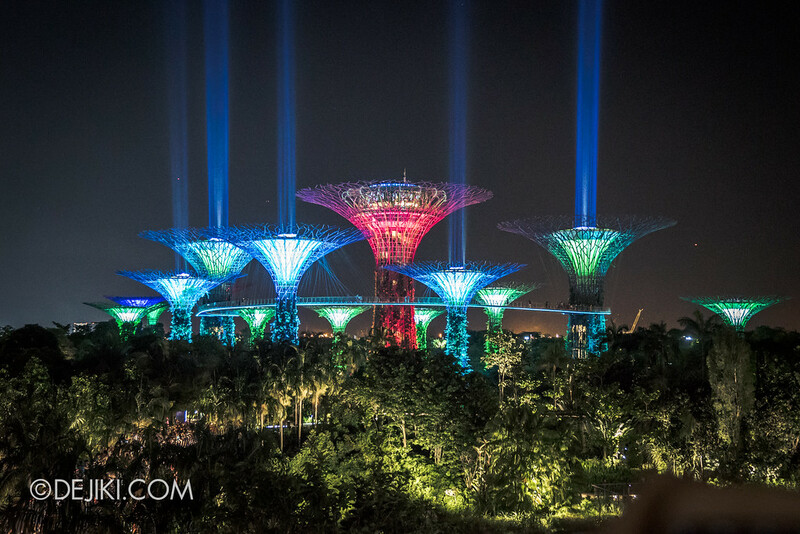 After the show, all the Supertrees at Gardens by the Bay take on the colours of Lightsabers, while a few of them become ‘SaberTrees’, with light blades piercing the skies. 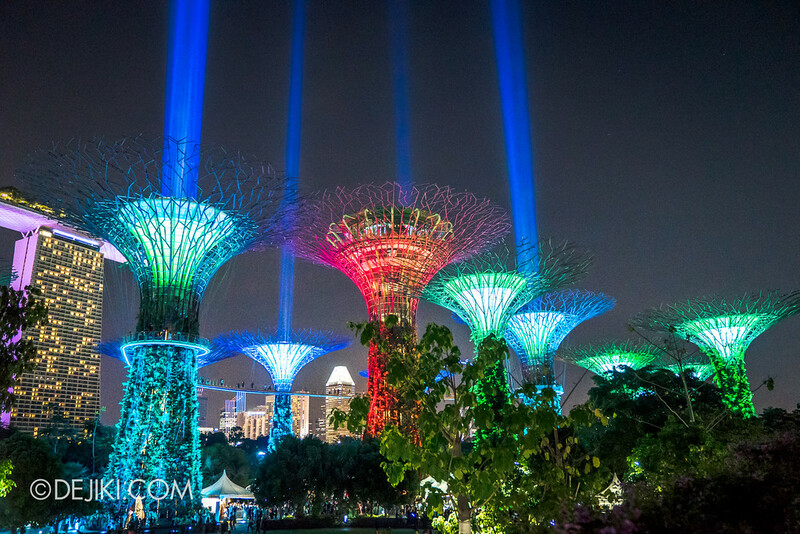 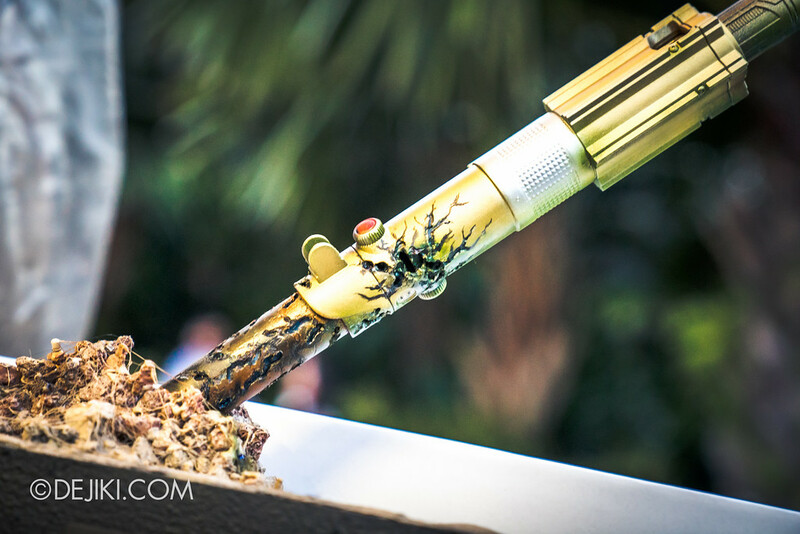 The SaberTrees will be activated during event nights, from 8:00pm till 12:00am (except during Garden Rhapsody shows). 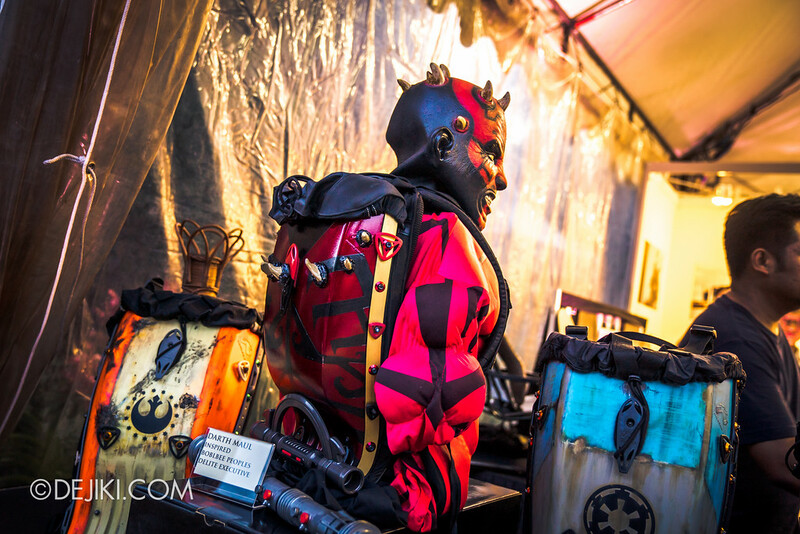 As this is a free event that would attract its vast fanbase, heavy crowds are expected during the festival nights. 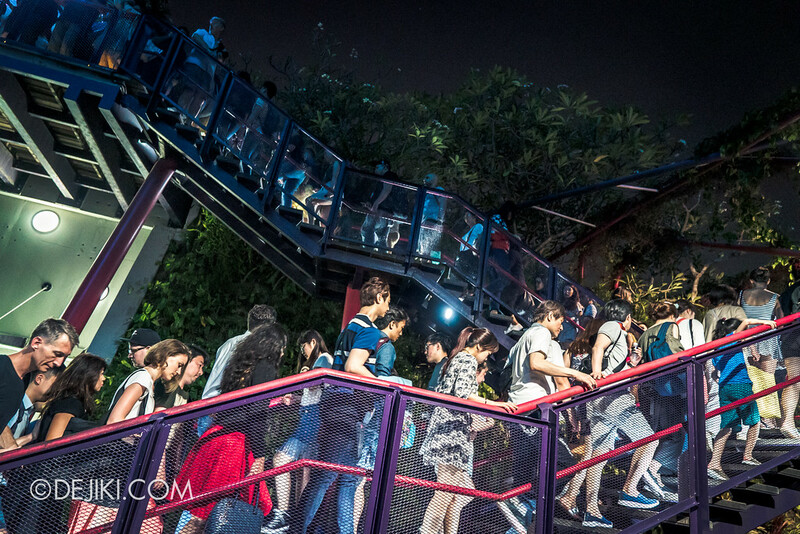 Some of the staircases were congested after the Garden Rhapsody show. 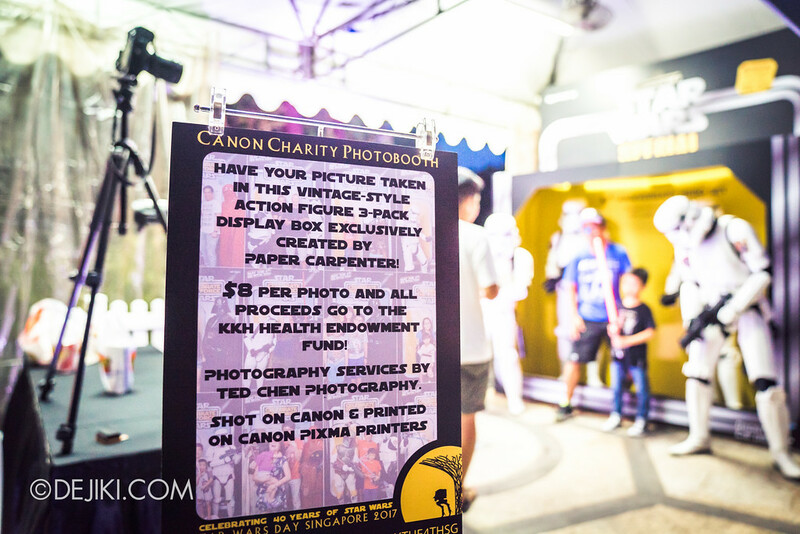 Fan Activities begin from 3:00pm. 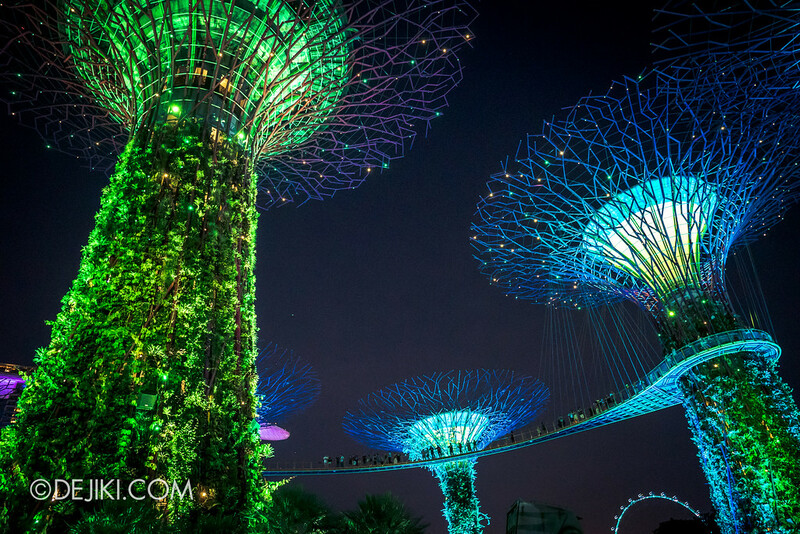 Activities vary, please refer to Gardens by the Bay’s event page for schedules.